Commercial rug cleaning can help retain an oriental rugs natural durability and unique look. These rugs are not a small investment and damage due to inconsistent or bad care can be devastating to their appearance and overall quality. Oriental rug cleaning in Pleasanton, CA is a process performed by professional cleaners using specialized facilities and solutions. An expert knows how to wash and dry these rugs in a way that prevents damage and can recommend regular home maintenance that will also protect the rug between cleanings. Some online resources state that an oriental rug can be cleaned at home. While this may be true for some rugs, the effects of regular home cleaners and solutions on the natural materials and dyes used in the rug are unknown. These cleaners could have negative results such as color bleeding, fading, and break down the fibers quicker. Home cleaning does not guarantee full removal of cleaners used and can result in mildew if the rug is not dried correctly. When you own one of these beautiful rugs and have invested time and money to have obtained it, severe disappointment and frustration would result if an inexperienced cleaner destroyed or harmed the rug. The same implies when attempting spot treatment or other cleaning on your own. 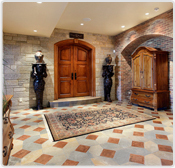 Area rug cleaning have specific knowledge of each rug type and the materials used to make it. They have chosen cleaning solutions that will work for specific rugs and will provide the most effective cleaning. Their processes make sure all solution is removed from the rug and that it is dried from both sides. Mildew, dry rot, and early wear are prevented by the processes used by an Oriental rug cleaning company. Expert cleaners also have experienced staff that can make repairs to the rug by machine and hand. Tattered fringes, rips, and tears require special attention and the person repairing them must be familiar with the techniques used. A reliable company will be able to make these repairs with the rug looking just as it did the day it was made. when you try to make the decision between having rug cleaning being done at home or taken to a facility, here are some things to consider that can make our decision easier. In home cleaning companies do not use cleaning solutions that are meant for authentic rugs. They instead use cleaners formulated for regular carpeting. These solutions can be harmful to the rugs fibers and the equipment they use normally performs only surface cleaning. Solutions can be left in the rug making it more susceptible for premature wearing and other problems. The rug will be dried flat which takes longer and is hard on its backing. Attempting to do cleaning yourself can have just as bad of an outcome. Area rug cleaning in Pleasanton, CA helps bypass these types of problems and care for your rug properly. Choosing a reliable commercial rug cleaning company makes the process hassle free and can help retain the quality of your authentic rug.